When a sound wave hits an obstacle and is scattered, the signal may be lost or degraded. But what if you could guide the signal around that obstacle, as if the interfering barrier didn't even exist? Recently, researchers at Nanjing University in China created a material from polyethylene membranes that does exactly that. Their final product, described this week in the Journal of Applied Physics, was an acoustical "metamaterial" with an effective density near zero (DNZ). This work could help to endow a transmission network with coveted properties such as high transmission around sharp corners, high-efficient wave splitting, and acoustic cloaking. "It's as if the entire [interior] space is missing," said Xiaojun Liu, a professor in the physics department at Nanjing University's Collaborative Innovation Center of Advanced Microstructures. "We were curious about whether we could make a simple but compact density-near-zero metamaterial from just a few tiny membranes," Liu said, "and, if so, can we further manipulate sound and make acoustic invisibility cloaks and other strange functional devices?" Previous prototypes had attempted to achieve density-near-zero by using coiled structures and phononic crystals to create "Dirac cones," but required large physical dimensions, complex geometric structures, and the difficult feat of slowing sound waves to extremely low velocities within scattering cylinders to be effective—limiting their practical applications. Their current paper proposes a physical, minimalist realization of their original density-near-zero idea, consisting of 0.125 mm-thick polyethylene membranes perforated with 9-millimeter-radius holes in a square grid inside of a metal waveguide, a physical structure for guiding sound waves. The intensive resonances of the membranes significantly reduce the structure's effective mass density, which is a measure of its dynamic response to incident sound waves. By Newton's second law, this reduction causes the average acceleration of the structure to approach infinity, which gives rise to sound tunneling. When sound at a frequency of 990 Hz is then conducted and rapidly accelerated through the material, the membranes act as a tunnel for sound, encapsulating the waves into local subwavelength regions. This arrangement allows the sound waves to pass through without accumulating a phase change or distorting the wavefront—analogous to the quantum tunneling effect, in which a particle crosses through a potential energy barrier otherwise insurmountable by classical mechanics. For future applications, the metamaterial would likely be integrated into acoustic circuits and structures. When implemented in a wave splitter, the researchers found an 80 percent increase in the efficiency of energy transmission, regardless of the wave's incident angle. 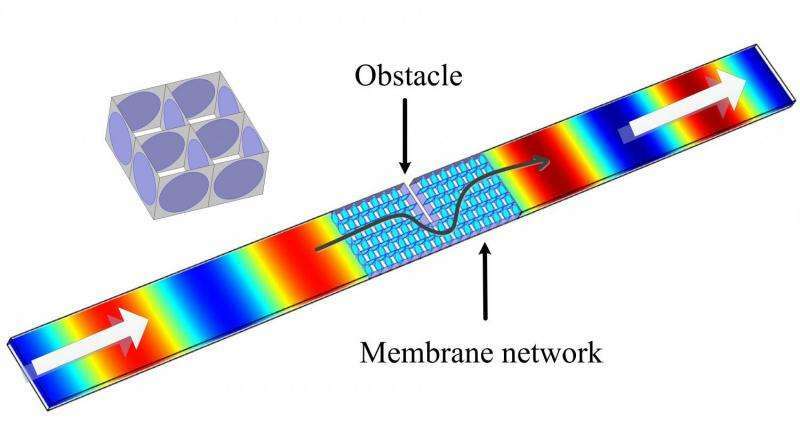 Additionally, the researchers are able to tune the frequency of the metamaterial network by altering the membrane's tension and physical dimensions, which they were unable to do in previous prototypes. Liu and his colleagues have already used the membrane network to fabricate a planar hyperlens, a device which magnifies one and two-dimensional objects on the subwavelength scale to compensate for the losses of acoustic waves carrying fine details of images as they pass a lens. This can allow scientists to see fine features of objects such as tumors, or minute flaws within airplane wings in industrial testing, that may otherwise be unobservable due to an instrument's diffractive limit. Additional planned applications include using smart acoustic structures, such as logic gates that can control acoustic waves by altering their propagation, for communication systems in environmental conditions too extreme for conventional electronic devices and photonic structures. "The vanishing mass density we've demonstrated is definitely more than a mathematical trick," said Liu.